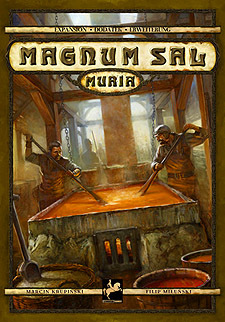 Magnum Sal Muria is an expansion, the game Magnum Sal is required to play. In Wieliczka a new mine is being constructed! The king sends foremen underground to plan the excavation of new shafts and the extract of salt. A saltworks has also appeared in the city. No more wasting the salt water pumped out of the mine! Horses are now at work turning the wheels in horse mills, and the miners continue their hard work underground. The king wants more white gold! Back underground. A game board with two new buildings. Mine foremen in each of the player colors. New royal orders that require brine to fulfill. Two new tools, including the capstan – the winning tool from a game design competition.